"Did you have a good trip, or did it rain?" my neighbor asked. 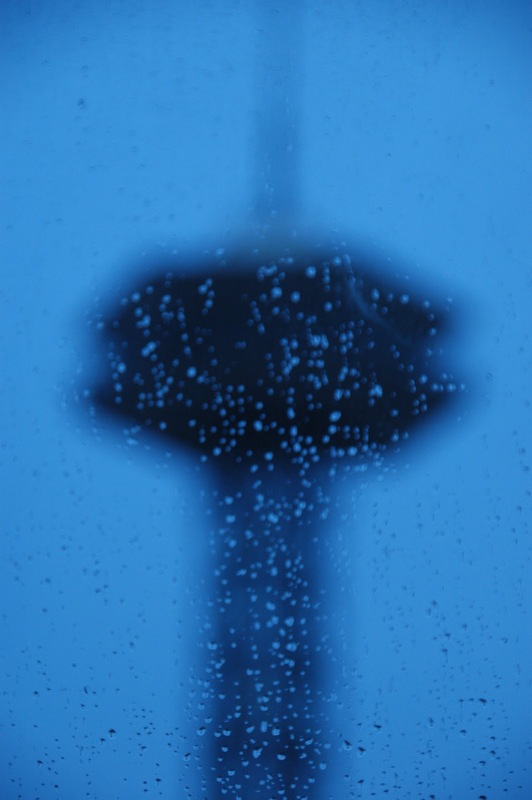 "It rained. And we did have a good trip," I responded. The trip she was referring to was our Mardi Gras vacation excursion to Boone, NC (two nights) and then to Gatlinburg, TN where we spent three nights and almost three whole days. We were in rain (and some snow) for most of the seven days we were gone. But that didn't really matter that much. The trip was a break from driving a school bus although we did manage to log almost 3,000 miles. We were greeted our first morning in Gatlinburg, by what else? Raindrops falling on our heads. Not really. We saw them on the window of our motel room. We had decided that since our snow skiing went well, we weren't going to be discouraged about a different kind of precipitation. The motel's continental breakfast of which we had bagels, did the trick. I had some coffee. Wifey had brought a hotpot we had purchased in San Francisco a number of years ago. It was promoted as heating water faster than a microwave. That's what she used to heat her water for tea. There was a hot water spigot on the coffee pot in the motel kitchen, but I didn't use it. Then it was off down a paved trail into the countryside where artists reside. It was early, most shops weren't open, so we decided to head to Pigeon Forge for our traditional trip to the Coleman store and to the Jockey outlet. I also browsed through the Izod store. We bought something at all three outlets. 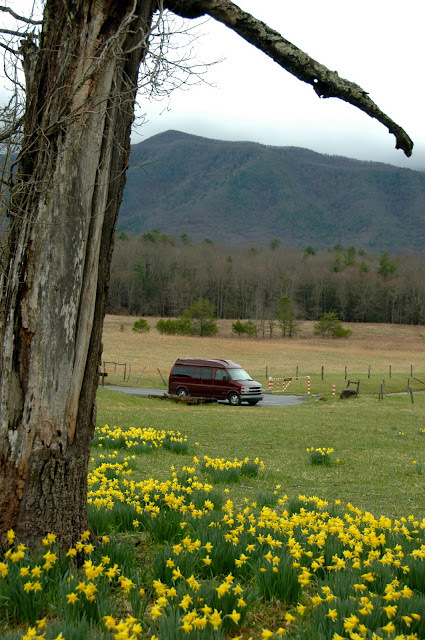 Then it was through Wear's Valley to Townsend and into the Great Smoky Mountain National Park for another traditional happening -- picnicking and then a jaunt around the 11-mile one-way Cades Cove Road. Rainfall during the previous week had caused the rivers in the park to rise and in places they were running furiously. Even at the Cades Cove picnic area, the small, pleasant streams that ran through the area in the summertimne had grown and were cascading over rocks. 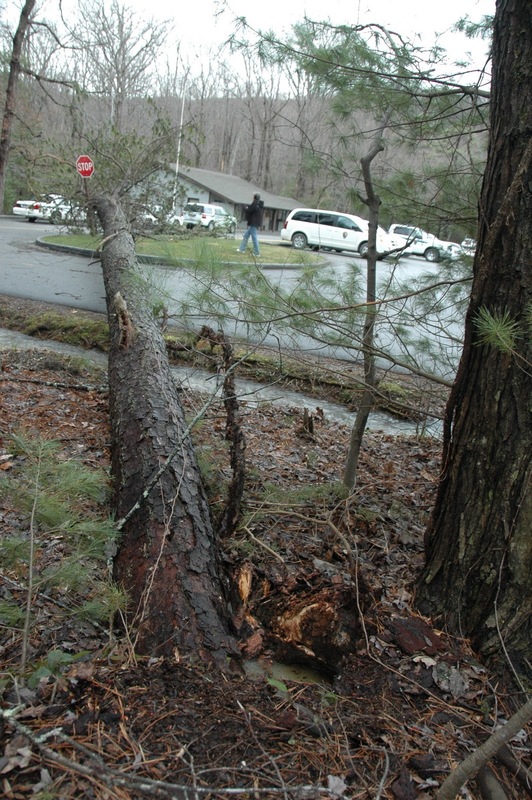 A pine tree was lying across the road at the parking area near the Ranger's station and the campground store in Cades Cove. Seems that the ground had been softened by the rain or either the wind blew it over. I think both were involved. We took a slow journey down the cove road enjoying the scenery while stopping to take pictures of deer and turkey, but no bears. It was just too early in the season. Heading out of the cove and toward Elmont Campground to the east, we took the Little River Road which ran, of course, along the Little River. But the river wasn't that little and inviting-looking like it is in the summer. The water was up and running fast. That apparently is what drew out two rafters that we saw making their way down the river. Elkmont campground was closed for the season, but we had to drive in to see how the river was as is meandered through the area. It was wild and wooly. 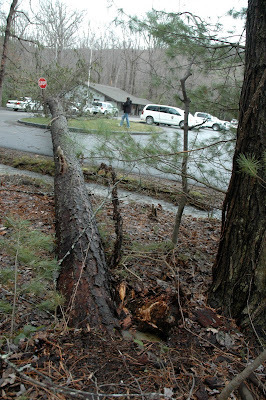 Next post: Tuesday, March 22, 2011 -- More on Gatlinburg and our snowy adventure to New Found Gap.